BlackBerry today confirmed that the company will be making an Android-based smartphone, with a launch date aimed for the end of 2015, even as it reported a greater-than-expected annual loss (via Re/code). The company reported that its latest quarterly loss was 13 cents per share on revenue of approximately $490 million, with analysts expecting 9 cents per share loss on revenue reaching closer to $600 million. Still, BlackBerry believes that its new handset, called the Priv, will boost its quarterly earnings as it heads into 2016. 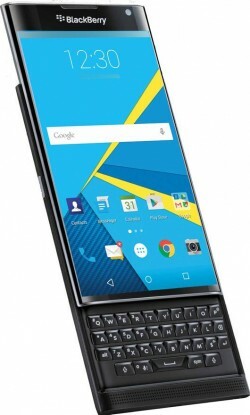 Confirming a previous rumor from June, the smartphone will have a slide-out keyboard and will combine "the best of BlackBerry security and productivity" with Android's robust mobile platform applications, according to BlackBerry CEO John Chen. The company confirmed Priv will launch by the end of 2015, and that the BlackBerry 10 OS will still be supported, getting a software update around March. Chen also mentioned that he has been aware of the company's steady decline, and that he'll stay in the business as long as there's money to be made. “If I can’t make money on the phone, I will be out of that telephone handset business,” Chen said. “There is a timeline; I won’t tell you when.” BlackBerry hopes Priv will fill a niche in the smartphone market with a device that can work as an enterprise-ready work machine, but be fueled by Android's "expansive mobile application ecosystem." Blackberry couldn't have picked a worse day to announce this......unless they're burying the story on purpose. Out of all 365 days of the year, this is the day that people care the least about Blackberry. Even a dead cat bounces when it hits the sidewalk. Interesting timing. This is like going to somebody's party and lightly whispering that you'll possibly throw a party of your own at some point. Apple simply destroyed their company (along with Samsung and Google I guess). This is incorrect. They did that themselves. They were complacent and sat on their hands while Apple and the others were changing the market. They destroyed themselves by thinking their sales were corporate driven, whereas the others understood that the market is consumer driven. So, the one thing blackberry users want (security) is obliterated by the fact it runs Android. Surely this makes the blackberry 'Priv' an oxymoron in itself? 2005 called. Again. They still want their slide out keyboard back. Is it 2005 again? RIM is still relevant? Slide out keyboard? Bad timing, but also bad decision. For Blackberry hardware is not a differentiator without their tightly coupled software and security ecosystem. They are really starting to scramble for scraps.